Whether you are a night owl or an early bird, what you crave when you hit your bed at the end of the day is sleep. So, do you have trouble sleeping and feel exhausted? It’s time to have a proper look at your diet. You might have heard that staring at the illuminated screen of your smartphone can cause insomnia, but more often it’s what you have eaten just before trying to doze off that’s responsible for you counting sheep at night. With that all said, let’s delve further into the foods you should not gobble down before you’re ready to hit the bed. \With the first one on our list, you know how great coffee is to keep you awake. Did you ever pull an allnighter? Or needed some extra energy in the mornings? Then coffee is the go to energy booster and you know about its immense benefits. However, when you’re trying to sleep, it’s a strictly no go. Caffeine in coffee (as you might know) keeps you awake, so avoid coffee in the evenings and preferably no coffee at all after lunch, or you might have to stay awake and counting sheep. \We all love soda- it makes us feel lively and refreshed at times, and having some during the day is fine. Avoid it before bed as it kicks away sleep. Of course, it could be nice to have once in awhile for dinner as an alternative to alcohol, but don’t make it a habit as it is bad for your overall health as well. \No, we don’t have any agenda against partying and takeaway dinners. However, the rest of your body might not love takeaway as much as your taste buds do. Why? Because pizzas are known to cause insomnia and make you feel tired. Well, you might have heard that fast foods and takeaway are bad for your health. It’s not only bad for your stomach and liver, but also for your sleep. For example, the sweet and sour tomato sauce might cause tummy troubles at 3 a.m. in the morning. Now, you decide if you love your fast food more or your sleep. If you love sugar, cereals, or both, this is seriously bad news for you. While having a bowl of cereals before bedtime is a good way to fill your tummy, experts say that it causes the sugar level in your blood to spike and crash, making your circadian sleep cycle erratic. If you cannot let go of your love for cereals or sugar, choose one with less than 5 gm of sugar per serving. And don’t forget to choose the high fiber version, which will make your metabolism relax and help you get more sleep. Who could have thought that eating spicy foods does more than excite your taste buds? Yes, it can excite your body causing heartburn, in addition to stomach burn. It can also raise your body temperature, and thus stop you from falling asleep. Generally, when you are sleeping, your body’s core temperature decreases, as your body parts become less active. However, when you consume spicy foods your stomach and other parts overwork, causing an increase in body metabolism, which hampers your sleep. Drinking water during the day can be a very healthy sign. However, during the evening when you are trying to slow down your metabolism and retire for the day, you need to go easy on the water. Considering dehydration during summer can cause you to become tired, you should make sure to consume plenty of it during the day, but not at night when you are trying to fall asleep easily. Additionally, when you consume too much water just before hitting the bed, you would have to get up numerous times to visit the bathroom. That can be a problem, as this will disrupt your sleep. If you love your bed partner, you might want to give up onions, because they don’t work too good as a mouth freshener. However, even if you sleep alone, you need to let go of raw onions in your dinner. Why? This is because they can cause gas, which affects the natural pressure in your stomach, and also cause heartburn. Prolonged consumption of raw onions under these circumstances can lead to acid reflux, and make you feel sad about your stomach health. Now, try to avoid those sweet and smelly raw ingredients in your dinner and you’d be fine. 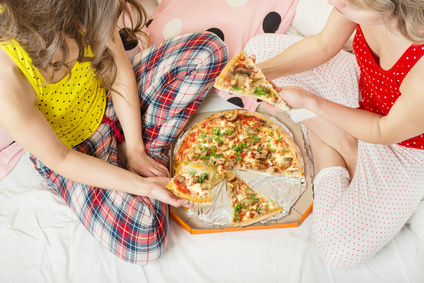 Yes, fries can be tasty, but you should avoid them before bed or as part of your dinner. The fries and ketchup combo might sound delicious, and never fail to be so, but you should give it up for the greater good aka your sleep. Due to the presence of the tomatoes, the ketchup can be extremely acidic. Add to that the secret ingredient of marinara sauce and you’d have the perfect mixture for heartburn, indigestion, and even acid reflux. Although red wine is great for your health, it’s not too great for your sleep. So, if you are an partyholic trying to get more sleep, you’d have to curb down on the alcohol and definitely smoking (OK, smoking is not a food, but you should still kepp off it!). Nicotine does damage to your lungs for sure, but it also disrupts your sleep cycle, keeping you awake at nights. You might be hungry, but never try to eat your fill like there’s no tomorrow. Not only will you face stomach issues, but also feel full and unable to ease off. So, while you are trying to fill your stomach, make sure that you leave a bit of space for breathing. So, now that you know about these foods you should avoid before bedtime, it’s time to get started on a diet chart. After all, you are responsible for your own health and it doesn’t have to be difficult. Once you get into a routine of consistently good sleep, you’ll never want to go back anyway!